Derbyshire is a county in the East Midlands of England and includes a large part of the Peak District National Park. The southern end of the Pennine Hills extends into the north of the county and the county also contains part of the National Forest. Derbyshire borders on Greater Manchester to the northwest, West Yorkshire to the north, South Yorkshire to the northeast, Nottinghamshire to the east, Leicestershire to the southeast, Staffordshire to the west and southwest and Cheshire also in the west. Derbyshire is known for being a diverse county with cities, towns and villages set in outstanding countryside with industry and leisure working together. Its main city is Derby, which although steeped in history, is one of Britain’s youngest cities and was awarded its Charter by HM the Queen in 1977. Derbyshire is a mixture of rural economy in the west and coal mining was the industry in the north and south and also in the Erewash Valley. The landscape varies from arable country in the flat areas of the south of Derby to hill farming of the high grit stone moorlands of the southern Pennines to the north of the city. The county is also rich in natural resources such as lead, iron, coal and limestone. The arrival of railways in the late 19th century and early 20th century led to a large number of stone quarry industries and although they have left their mark on the countryside today stone quarrying is still a major industry. The Peak District is made up of two areas The White Peak which is a limestone plateau of green fields with rolling hills and many dales and The Dark Peak (or High Peak) which is a series of higher, wilder and boggier grit stone moorlands. The Peak District is also known as the Derbyshire Peak District and covers areas of Greater Manchester, Staffordshire, Cheshire, West Yorkshire and South Yorkshire. Although there are no prominent boundaries the central and most rural areas of the Peaks lie within the Peak District National Park. The National Park, the first to be set up in Britain, covers 555 square miles three quarters of which lie within Derbyshire and the other quarter in parts of Cheshire, Greater Manchester and South and West Yorkshire and 12% of the park is owned by the National Trust a charity which aims to conserve historic and natural landscapes and does not receive government funding. The Peak District National Park Authority provides public facilities such as car parks, public toilets, visitor centres and also maintains the rural nature of the park although most of the land is still owned by the traditional landlords. Castleton is a most wonderful and charming village in the Peak District. It is situated at the western end of the Hope Valley between the Dark Peak and the White Peak areas. Castleton is overlooked by the Great Ridge which separates the Hope Valley to the south from Edale to the north. The ridge runs from Mam Tor to Back Tor and Lose Hill via the pass of Hollins Cross. Beyond the ridge at the far side of the Valley of Edale is Kinder Scout. Castleton is a very popular destination with tourists and walkers flocking from all over the country. There is plenty to see and do in Castleton from picturesque scenery, interesting geology, the ruined Norman Peveril Castle and four show caves Peak Cavern, Speedwell Cavern, Blue John Cavern and Treak Cliff Cavern. Peveril Castle standing above Castleton was built in 1080 by William the Conqueror’s son, William Peveril, to oversee the king’s Royal Forest. Originally it was a wooden building but was rebuilt in stone around 1175. The stream that flows through the village from Peak Cavern is Peakshole Water a tributary of the River Noe and the River Noe is a tributary of Derbyshire’s River Derwent. For such a small village it has a mixture of shops and six pubs and the village square, with narrow streets and alleyways leading from it, is surrounded by quaint old houses and cottages. For the walker there are many public footpaths leading from the village from easy river walks to short or long strenuous walks. The only westbound exit from the village is now the unclassified road over Winnats Pass, a steep narrow limestone gorge, which is unsuitable for heavy vehicles or high volumes of traffic so the Hope Valley road from the east is the road mainly used to enter and leave the village. Another road, the A625, used to go over Mam Tor to Chapel-en-le-Frith but after continual collapses and repairs it was eventually abandoned in 1979. Castleton prospered from lead mining and the Odin Mine situated a mile west of the village is one of the oldest mines in the country. This created and enlarged local caverns four of which are now open to the public. Peak Cavern is in the centre of the village, Speedwell Cavern is at the foot of Winnats Pass, Blue John and Treak Cliff Caverns are close by on the lower slopes of Mam Tor. Blue John is a semi-precious mineral (a local variety of Fluorspar with a fine colouring) which is still mined in small amounts and made locally into jewellery. Blue John jewellery can be purchased in the village shops. Since the 1920s the main mineral industry has been cement and while Hope Cement Works is located near to Hope the quarry is nearer to Castleton. 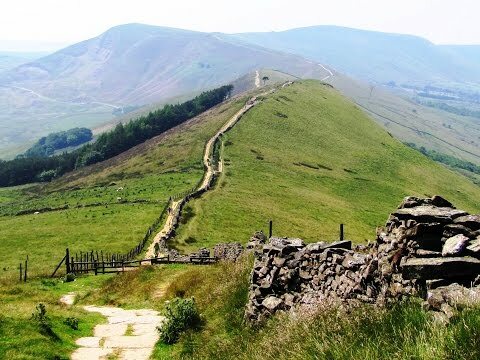 Lose Hill or Ward’s Piece, at approx 476 metres, is situated at the end of Great Ridge and provides outstanding views across to Mam Tor and of both the Hope and Edale valleys. Hollins Cross is a pass or hause where many paths converge and cross from both the Hope and Edale valleys. Mam Tor at 517 m (1,696 ft) is a famous view point and landmark near the top of Winnats Pass, and forms the eastern end of Rushup Edge and also dominates the western end of the Great Ridge. Its name means “mother hill” so called because frequent landslips caused by unstable lower layers of shale on its eastern face have resulted in a multitude of mini hills beneath it. Layers of tarmac and gravel are up to 2 metres thick in places where efforts have been made to keep the road open. Mam Tor is also known as the Shivering Mountain. On the summit there was once a late Bronze Age and early Iron Age Fort hill fort and the fortifications can still be seen. There are signs of two Bronze Age burial mounds one on the summit and one just below. The ramparts can be followed most of the way around the hill top and there are clear remains of two gateways on the paths leading from Mam Nick and from Hollins Cross. Excavations have shown that it was probably a complete village rather than just a defensive site. Today the escarpments around Mam Tor nearby Lord’s Seat and Rushup Edge attract winds making the area perfect and a very popular place for hang gliding and paragliding. Winnats Pass is a steep narrow limestone gorge surrounded by towering limestone pinnacles and lies in the National Trust’s High Peak Estate. The pass was once thought to have originated as a giant collapsed cavern but recently it is said that it was a ravine between the coral reefs that originally formed the limestone. In the car park opposite the Tourist Information Centre we turn left and follow the side of the little stream to come out at Hollowford Road. We turn left and follow the road passing an old building on our right. We bear right at the signpost for Hollowford Centre and keep following the track. Just after crossing over some stepping stones over a little stream we turn left through the gate, sign posted Lose Hill. We head forwards slightly uphill towards Riding House Farm. Just before the farm we turn right over a little bridge walk through a field then half way up in the next field we turn right through a tiny gate. We head forward through the field with the wire fence on our left. We go through another tiny gate sign posted Lose Hill and turn left uphill and walk to the right of some trees on the sky line. We keep heading forwards uphill following the fence line on our right. We cross over two stiles and keep heading forwards uphill on the track, we can see in front of us, to the top of Lose Hill. We then turn left and follow the track along the ridge top to Hollins Cross and then continue to the top of Mam Tor. From Mam Tor we head downhill on the stone steps and just before the road we go through a gate and turn left to cross over the field to the road and a parking area. We cross straight over the road and bear left through the field to cross over another road. We head forwards to the farm then just after the farm we turn left onto the road. We now head downhill on Winnats Pass and after a short way we walk on the grass verge. We walk down to the bottom of the pass then just after passing Speedwell Cavern we turn right through the gate sign posted Long Cliff. We follow the track with the wall on our left then at the main road we turn right back into Castleton. This is a moderate to hard walk on good paths and tracks with steep inclines and declines. Elevation: Approx lowest point 182 m (597 ft) approx highest point 474.5 m (1557 ft). Approx 6.5 miles allow 3 hours using OS explorer map OL1, The Peak District, Dark Peak Area. Start point: Castleton car park. Castleton in the Hope Valley, Peak District, Derbyshire. From the M1 take junction 36 at the roundabout take the 2nd exit onto the A61. At the main t-junction turn left still on the A61. On the dual carriage way turn right at the 2nd roundabout onto the A6101 at the end turn right onto the A57 towards Glossop and then turn left at Ladybower Reservoir onto the A6013. After passing through Bamford continue to the T-Junction. Turn right onto the A6187 passing through Hope then continue on to Castleton. Car park is on the right in the village centre. Parking: Pay and display car park £5 all day. Some free road side parking in the village centre and also some road side parking, fees apply at weekends only, just on the outskirts of the village towards Winnats Pass. There are public toilets in How Lane and in the car park near the Tourist Information Centre. For refreshments there are shops, cafes, take-away and six pubs serving good food which also have accommodation. Wow… I remember my first visit to England two years ago. On my first day my inlaws tour me around the breathtaking scenery of Castleton. I remember having mulled wine after a long walk around in a freezing cold weather. I think that everything said made a ton of sense. Hill and Mam Tor round | Peak District Walks | Walking Guide is a little plain. You should peek at Yahoo’s front page and see how they create post headlines to get viewers to open the links. Good way of describing, and pleasant post to get information on the topic of my presentation topic, which i am going to deliver in institution of higher education. savings account will be ideal. Now i’m very happy that I found this during my hunt for something concerning this. reviews, however this blog gives feature based posts. hi!,I really like your writing so much! proportion we be in contact more about your post on AOL? you to continue your great work, have a nice day! There are plenty of spotlights with plug in chords instead of battery if you’d prefer Ask at a hardware store! The when I read a weblog, I’m hoping which it doesnt disappoint me approximately this. After all, Yes, it was my method to read, but When i thought youd have something interesting to say. All I hear can be a number of whining about something you could fix if you werent too busy in search of attention. Currently it sounds like Movable Type is the top blogging platform out there right now.